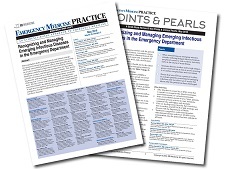 CME: This issue includes 4 AMA PRA Category 1 Credits™; 4 ACEP Category I credits; 4 AAFP Prescribed credits; and 4 AOA Category 2 A or 2B CME credits. 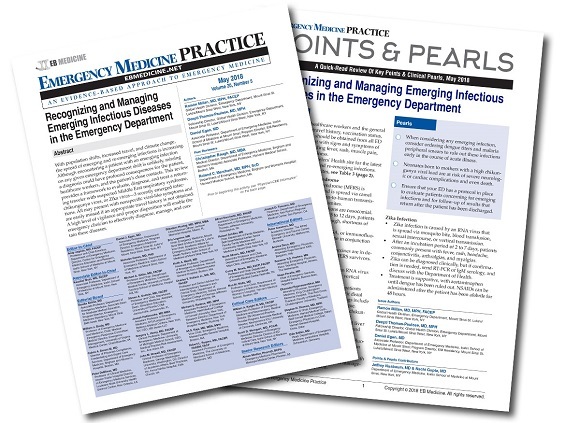 Included as part of the 4 credits, this CME activity is eligible for 4 Infection Control CME credits, subject to your state and institutional approval. This was a very good article. I will be on the lookout for these re-emerging diseases in people with hx of a recent travel. I now know what to think of and evaluate for patients with fever and rash who have traveled recently. I now have an increased understanding of MERS. I'll have broader consideration of emerging infectious diseases in patients with an appropriate travel history as well as consideration of local exposure to such agents in those who have not traveled recently.